In All Is Vanity (Mirrorless Version) Adad Hannah stages a historical drawing as a video. The artist asks a pair of identical twins to perform a tableau vivant in order to render a mirror where there is none, creating an illusion within an illusion. The source of inspiration for Hannah’s installation is an image made in 1892 by an eighteen-year-old illustrator named Charles Allan Gilbert (1873-1929). Gilbert’s drawing, entitled All Is Vanity, remains one of the world’s most famous optical illusions. 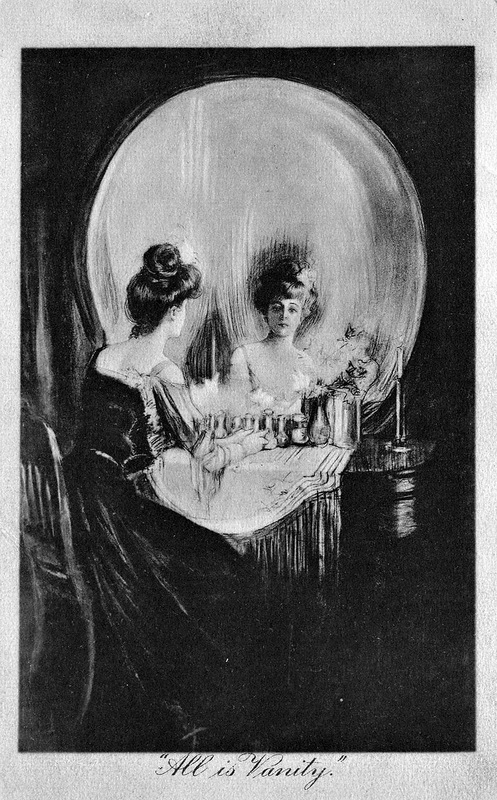 It depicts a young woman surrounded by perfume and makeup, gazing at her reflection in the oval mirror of a wooden vanity. However, the drawing can also be read as a large human skull, the objects carefully arranged so that the vanity’s mirror forms the dome of the skull, the woman’s head and reflection its eye sockets, her toiletry bottles doubling as the skull’s jagged teeth, and the table cloth delineating the jaw line. This clever image was sold to Life Publishing Co. in 1902, and the print quickly became a bestseller. In the BMO Project Room, Hannah has reconstructed Gilbert’s nineteenth-century optical illusion with his own rendering of All Is Vanity in high-definition video using a custom-built set. 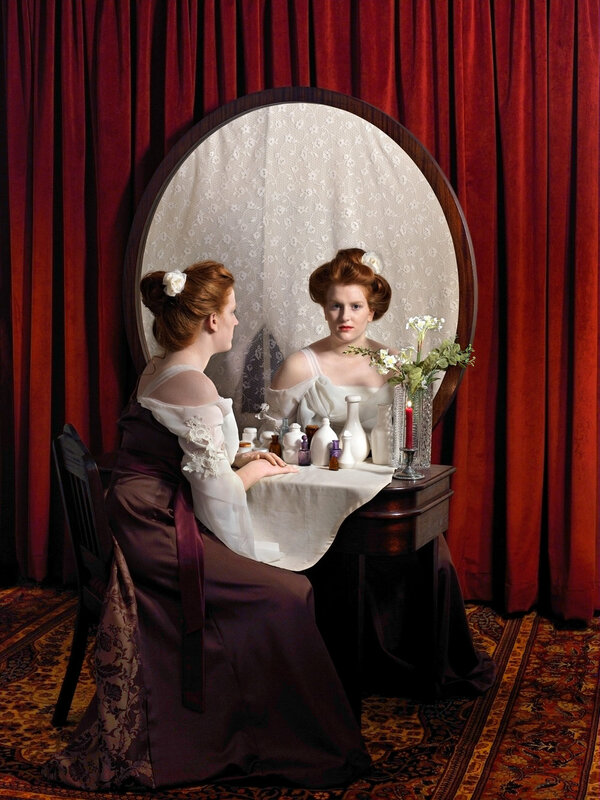 In this version there is no mirror – the oval of the vanity is an empty wooden frame – and Hannah casts twins to perform the woman and her reflection, a way of creating the appearance of a mirror where there is only an empty opening. The vertical video on the plasma screen is an 11-minute 46-second continuous shot: Hannah posed the twins across from each other and asked them to remain as still as possible for the duration of the piece. The blinking and breathing of the twins becomes evidence of time passing, which breaks the static nature of Gilbert’s original drawing and reminds viewers of their own existence within the flux of space and time. The mise-en-scène is recreated within the exhibition space, with all elements of the set – furniture, carpet, curtains, lights, video camera – preserved and displayed in the room. 2009, All is Vanity (Mirrorless Version), BMO Project Room, Toronto. Curated by Dawn Cain. 2010-2011, 2010 Canadian Biennial: It Is What It Is, National Galley of Canada, Ottawa.